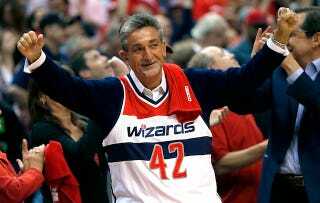 Ted Leonsis is a rich old guy who owns the Washington Wizards and also maintains a blog called Ted's Take. We've come across this blog before, but this morning's entry is really something. It seems that Leonsis has recently graduated from the Jack Torrance School of Blogging. Here's a screencap of the site, so that you can get the full experience. Pretty good take, Ted, but you made a rookie blogging mistake and posted this in the wrong category. "Crumbling Psyche" is where this one belongs, not "Sports."